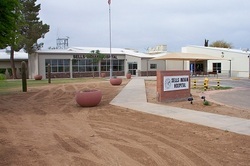 sector of the Tohono O'odham Reservation, and the San Simon Health Center located 30 miles east of Ajo Arizona. The hospital provides general medical and primary care in an inpatient and outpatient basis and 24 hour ER services. A 34-bed facility, built in 1961 with JCAHO accreditation, is the central component of the Sells Service Unit. Inpatient admission average about 1,000 per year. highest occurrences of Type II Diabetes in the world. The study, treatment, and prevention of diabetes is a major concern. Diabetes prevention Projects are in place in the schools and community, a collaborative effort of IHS and the Tohono O'odham Health Department. The programs, including several rural field units, are geared toward educating in methods of coping with and preventing the disease. was no loss of life but the hospital, equipment and all records were destroyed. To meet the emergent healthcare needs, the San Xavier Sanitarium (built in 1931) was converted to a general hospital providing inpatient and outpatient care. By July 1, 1955, US Public Health Service took over the responsibility of heath programs and a mobile health unit brought medical care to the more isolated areas of the reservation, including a new health at Santa Rosa in 1959.In July 1959, ground breaking activities took place west of Sells. Dr. James R. Shaw IHS Director was on hand to turn the first shovel of dirt. The new 50-bed facility was built of concrete masonry set on reinforced concrete footings and the interior frame made of steel. The hospital, living quarters and equipment cost $2 million. By early 1960's, the hospital was open for business and has remained open for the past 47 years!